Retired Bishop Armando A. Rodriguez speaks to a crowd during the General Conference of the Methodist Church of Cuba. 2011 photo from Armando Rodriguez Jr.
Editor's note: The faith and perseverance of Armando A. Rodriguez of Lakeland, retired bishop of the Methodist Church in Cuba, is among the stories of noteworthy Floridians preserved at Florida Southern College's Center for Florida History and featured in an article in The Ledger. Rodriguez is the father of Rev. Armando Rodriguez Jr., senior pastor of John Wesley UMC, Tallahassee. LAKELAND -- During Fidel Castro's first decade as Cuba's president, religion was ruled irrelevant. The new regime exiled many of the country's leading religious leaders while others fled. Armando Rodriguez was among a handful of Methodist clergy who resisted the new Communist regime and, in time, united the faithful to rebuild the church. 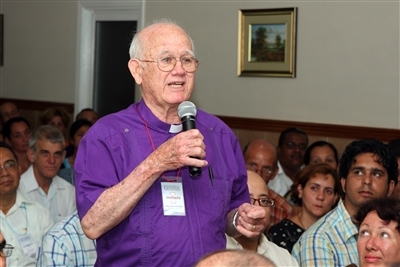 Rodriguez rose to become the Methodist Bishop of Cuba, a position he held until 1990, serving 22 years in that post. Retired and living in Lakeland, Rodriguez, 83, lives his life cloaked in anonymity. But his story – beginning as a child on his family's sugarcane farm, later as an accountant for a large sugar corporation then continuing through the political upheavals of his island home and its impact on Cuba's religious infrastructure — is preserved, along with the stories of other interesting Floridians. The credit goes to Mike Denham, professor of history and director of the Center for Florida History at Lakeland's Florida Southern College.